Great big thanks to Island City Brewing Company for hosting Ready Set School’s 2nd annual Silent Auction! $606 was raised to help Winona County kids purchase supplies and clothing for the upcoming school year. 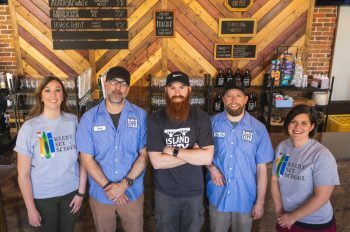 Pictured (L-R): RSS Board Member Tricia Wehrenberg, ICB Packager Jay Burros, ICB Brewery Manager Doug Irwin, ICB Cellarman Troy Altobell, and RSS Board Member Kate Carlson.